Turkey hunting is not always easy. We all love it when the gobblers respond to our calls then come in strutting with big fans, long beards and wings dragging. But it doesn’t always happen that way. Some days hunters just have to work harder and smarter to get those toms in range. The weather has played havoc with turkey hunting these past few weeks. 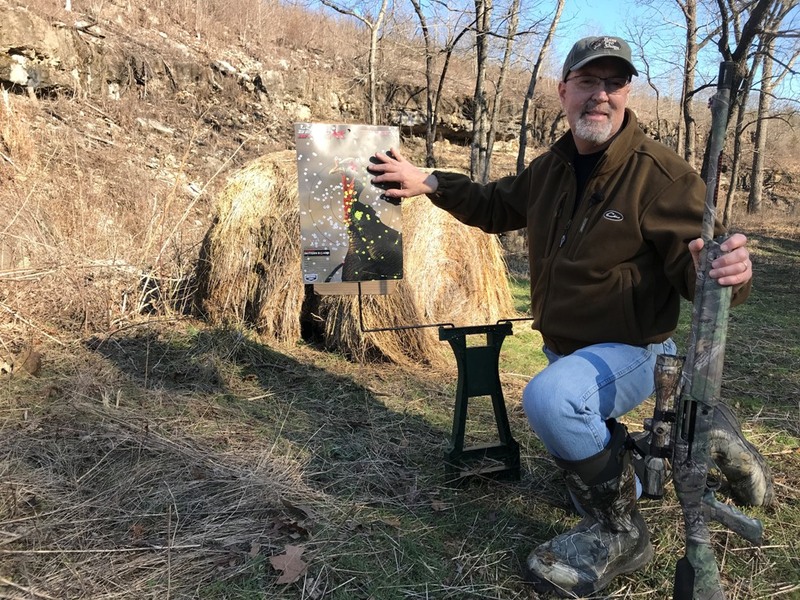 We’ve had hunters from Tennessee, Kansas, Missouri to Wisconsin and states in-between share their frustrations with hunting and the unusual spring weather: colder temperatures, rain, and even snow. For us and others, it’s been a tough year to locate gobblers. Hunting in Tennessee, then Kansas and now Missouri has had us pulling out all the tools and tricks to get birds in range. Here in Missouri, it’s early in the season, the toms seem to be henned up. When they are with the hens it is hard to entice them away with calling. Try to call hens in as the toms often follow. Use soft feeding calls: yelp, soft purr, or relaxed (not aggressive) clucks. Set up your decoys in feeding positions. If you KNOW there are toms in the area – sit still and wait. It’s not necessarily fun since the interaction and action is missing but patience can be your best strategy to punch a tag when that tom quietly comes into the field. Every day is different. Just because the birds don’t respond one day, they may the next. Keep trying. Weather: birds are still out there when it’s cold and windy, they’re quiet but still moving and feeding. Figure out where they are roosting and feeding then get in-between or in front of them. We had two good examples of turkey hunts last year where the unseasonably cool and wet spring posed challenges during turkey season. 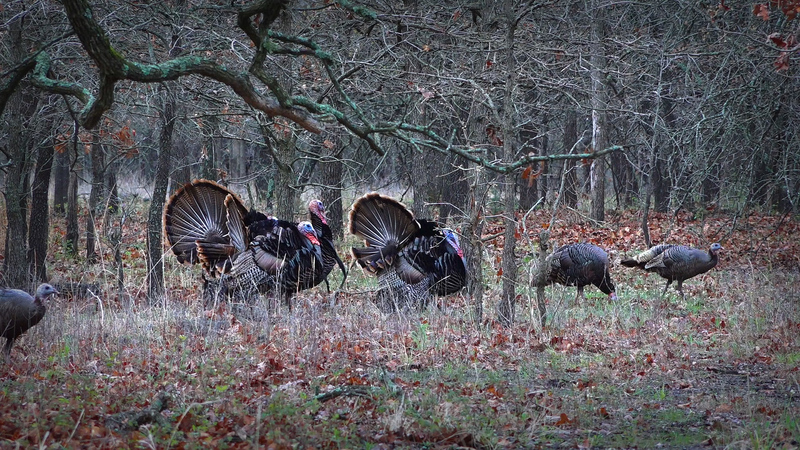 You can see how changing locations and strategies paid off for Clay and I in this video when turkey hunting during the late season and the toms went quiet and did not respond to our locator calls. Also, Heath and Lindsey’s Kansas hunt last year required a change in strategies. After a few days of colder weather they went out for a hunt. The weather during the first morning of their hunt seemed perfect but the toms were silent. They adjusted their strategy for the afternoon and soon had a gobbler in range. Watch that hunt by clicking here. Our encouragement to you if you haven’t tagged yet is to remember the three “P’s” of turkey hunting: patience, persistance and position. While you’re hunting, take time to listen not just to the gobblers but also for what the Creator is saying to you. One of the goals here at GrowingDeer is teaching lessons to future generations of hunters that will play a role in hunting and wildlife conservation. One way we do this is teach wildlife and habitat management techniques to our interns. These are young men and women who volunteer at The Proving Grounds to get hands-on experience either during their college coursework or soon after graduation. You often see these interns on GrowingDeer videos. Our current interns are Tyler McKinney and Jacob Hamilton. We introduced Tyler to you last fall in this blog. Now it’s time to share more about Jacob so that you can know who he is when you see him in the weekly videos. He is from Jackson, TN and graduated from Austin Peay State University in December of 2016. He has a degree in Agriculture Science with an emphasis in Forestry and Wildlife Conservation. 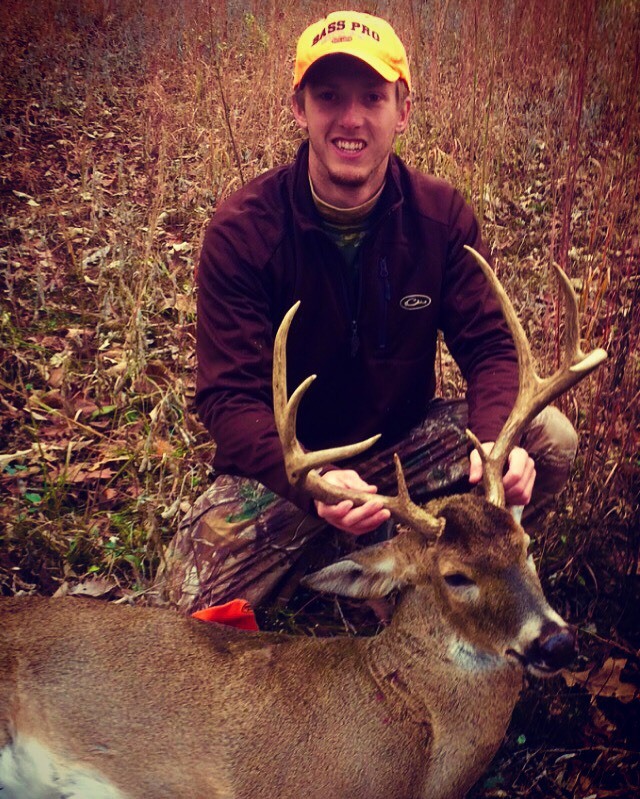 This school did not have a degree program in Wildlife Management so Jacob decided to intern with GrowingDeer to strengthen his knowledge base and jump start his career in wildlife. He hopes to one day work for a wildlife consulting firm or manage wildlife and forest resources in a state park. Jacob has been deer hunting for about 10 years. He killed his first deer at the age of 14 on his family property on a foggy morning during youth season. I asked Jacob to tell us about one of his favorite or most memorable hunting experiences. He enthusiastically shared with me how two years ago he killed a big 8 pointer that he had hunted over two seasons. He was especially proud of this buck because he really had to “work” to get him. It all started by planting food plots on a farm he had permission to hunt that was adjacent to his family land. He put in a clover food plot (keeping it mowed and sprayed), left standing beans at one end and groomed the CRP that was adjacent to it by putting in shooting lanes. He was disciplined and only hunted this plot with the right wind. When he didn’t succeed the first season, he moved his stand location down field. His work and perseverance paid off on a morning in late November. The buck came to the food plot, made a scrape and then Jacob took the 70 yard shot with his rifle. Along with deer hunting, Jacob is an avid duck hunter! (Being from western Tennessee this is understandable!) He enjoys duck hunting because it’s more social: fellowship with good conversations in the duck blind, the interactive calling to the birds, and of course, the shooting action. Jacob is an avid fisherman. Fishing has always been something his family does together. 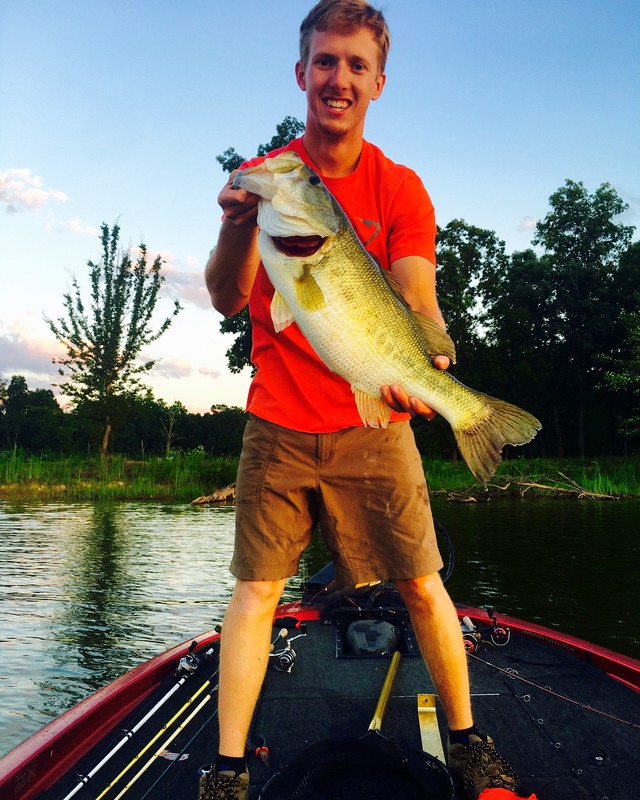 He joined and took a leadership role with the fishing team at his university. Under his leadership, the team grew and achieved solid national rankings at fishing competitions (ranked 27th and 30th out of 330 schools competing). When it’s not hunting season, you’ll most likely find Jacob on the water fishing. He is looking forward to the annual family fishing trip the last full week of April. For over 50 years the men in his family go to Kentucky Lake for a week of camping, fishing, corn hole and public land turkey hunting. There will be up to 40 men in his family from Texas, Tennessee, and even Idaho coming together for this outing. We appreciate the time we get to spend with Jacob. He will be with us through the summer. Keep an eye out for him in our weekly videos and on Facebook where I’m sure we’ll be showing you more photos of his fishing and hunting success! If you or someone you know is interested in becoming an interns with GrowingDeer, please click here for more information. I’ve recently shared tips from world champion turkey callers that will help us all become better at turkey calling and hunting this season. Becoming a proficient caller is the first key to get a tom to close the distance. My decoy setups are chosen based on the different hunting situations. These are things like the local terrain, where the birds are in the breeding season and the habitat. Below are several decoying strategies I use. Jake/Hen combo: A jake decoy with a hen can be a strong attractant to a dominant tom. I use this combo frequently at the beginning of the hunting season when the toms are sorting out their dominance. I position the jake about two to three feet away from the hen then put the head up so that red head draws the attention of the dominant gobbler. It’s a good idea to put the lone hen in a feeder pose to create a more natural and enticing setup. Think about it: if both are upright and alert they are sending communicating that something has them nervous. As the season progresses, this remains an effective setup. As the days go on, hens leave and go sit on the nest. When it appears that a jake still has a hen with him it can make a boss tom jealous and get him fired up to come into range! One of my favorites is having a jake sit right behind a hen when she’s in the breeding pose. Breeder Hen/Full Strut Tom: When toms are running together and working to sort out who’s the boss, another effective decoy strategy is to put a hen decoy in a breeding position in combination with a strutting tom. I set the Miss Purr-fect hen decoy on the ground (without a stake) in a breeder pose, then add a Papa Strut behind her. The local toms will see the “intruder” and come in to see who’s messing with their hen! Three Hens: Setting up three hens is an almost irresistible setup for a tom. It’s especially effective if you’re hunting an area with bully jakes and gobblers won’t come in. But what gobbler is not coming in to three hens? When you stake out the hens, put one in the breeding pose, another in a feeding pose and another in an alert pose. I mentioned above that we use Montana Decoys. These are easy to carry, multiple decoys can fit into your vest and they are very versatile. The days of lugging a bagful of hard, loud decoys are over! They just fold up to fit in your vest; they are adjustable and have different leg pole sleeves to enhance various poses. Think about the message you want to send when posing the heads of the decoys and add movement by using their Motion Stake. We’ve used all these setups at different times and in different states. Each one has proven successful during the right conditions. When scouting and then during the hunt, read the mood of the turkeys and create your decoy strategy around those observations. For more details on how to setup your decoys, click here to get a free guide from Montanna Decoy. We’ve been having Field Days at The Proving Grounds for many years. Each time we welcome the visitors as strangers then find that by the end of the weekend we’ve made new friends. Most all the folks attending the tour watch GrowingDeer and this is our chance to get to know them just a little better. We love talking to them, hearing about their goals for their hunting properties, their hunting stories, and their families. There were so many kind, friendly folks here at the Field Event: 128 folks from Georgia to New York to Michigan to Texas. Each and every one of them were passionate about deer hunting and deer management. Here are a few of the folks and just a little insight into why they came. Ron came all the way from Savannah, Georgia to see first-hand how we are managing The Proving Grounds for better hunting. I talked to Ron during the social time on Friday before the bow shoot started. He said his hunt club members were all a bit “old school”. Ron has taken the initiative to improve the club. He was interested in learning how to better improve the food plots in the sandy soils of eastern Georgia. The presentations and field examples of cover crops, crop rotation, and the “Buffalo system” we are using gave him ideas to take back and implement on his club. Rick and Tina, a couple with hunting land here in Missouri came to the Field Day event looking to find a balance for their property between managed food plots and native vegetation along with how to use native grasses for bedding areas. The food plot demos and presentations along with the up-close, personal looks at the areas with prescribed fire were very helpful to them. One of the last questions by Tina was for a recommendation of the best type of boot to wear when working a prescribed fire. They plan on cutting more cedars and implementing prescribed fire on their property! 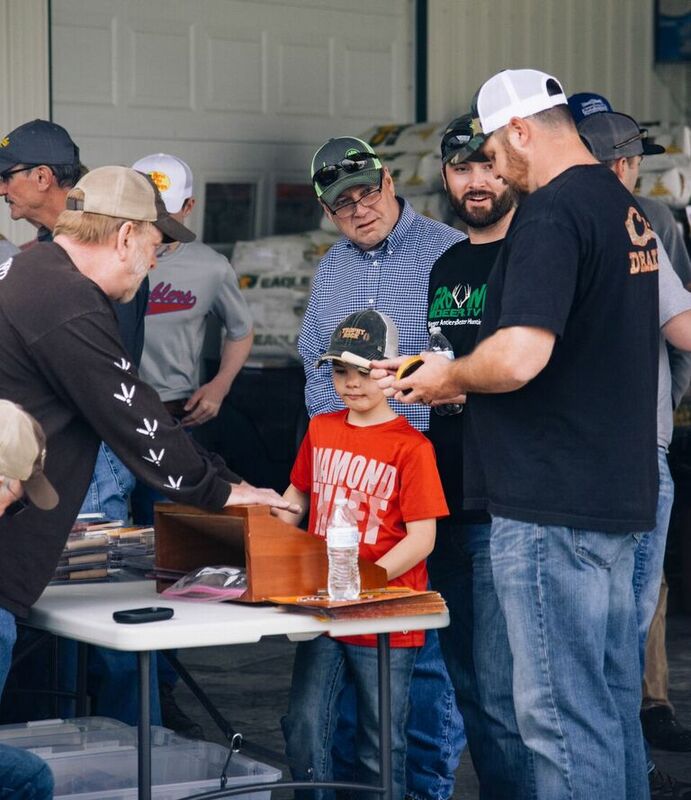 Paul and his son from the St. Louis, MO area; they came looking for tips to improve their hunting property – specifically how to get it to hold more deer. Stephen and his son Chris from Houston, Texas: Stephen has been hunting for many years. He wanted to introduce his step-son Chris to hunting. He started by showing Chris the video where young Rylan White was hunting. After watching Rylan’s hunt, Chris decided that if Rylan could hunt, he could too! Now this young boy is “ate up” with hunting and watches all the GrowingDeer videos. Stephen and the family came to Branson for the weekend so that he and Chris could meet us and learn more about hunting. 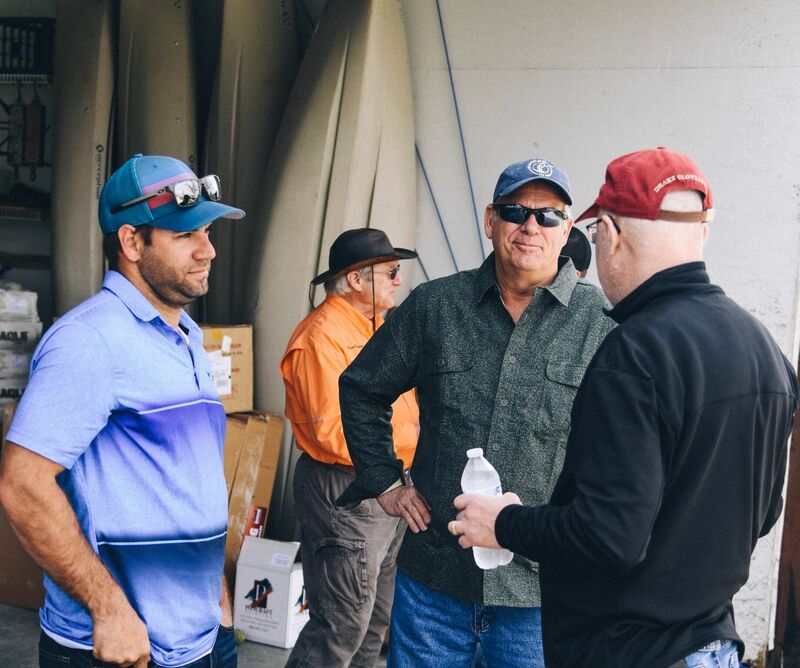 Chris had the biggest smile on his face all weekend as he listened to the field presentations and then, during the social times met Rylan White. It looked like the two of them were having a great time as they played around the office and had Crystal exhausted from hours of chase and fetch! In addition to the social aspect of the weekend, Grant and Daniel were able to really jump in and get specific with some of the hunters with advice on their hunting land. We spent some time getting to know Tom. He had retired to Florida but returned to his home state of Michigan to hunt at his club. The club is a lease on over 2,000 acres but with a lot of members in the lease. His concern: no one was harvesting does. He wanted to figure out a balance between deer and food. The reality was that he needed to harvest does…more than he could do himself. Daniel gave him advice on how to work with members of the club as well as increase the available food. Daniel was able to spend time with Tim and Taylor from Illinois. Daniel reviewed their maps and discussed their current strategies for hunting the land. The final analysis was that their hunting strategies were good, but given they had the largest block of timber in the area, they needed a late season food source for after the harvest of the local ag crops. He encouraged them to use the timber more as a sanctuary and hunt the edges of the timber. We try really hard to present information and answer the questions from the hunters at our field events. It’s intense, but rewarding for everyone. We’ll have highlights of the field day when we release the new video next Monday morning. Check it out and watch for tips that might help you with your deer hunting and land management objectives. It will also include a turkey hunting demo that received a very positive response. 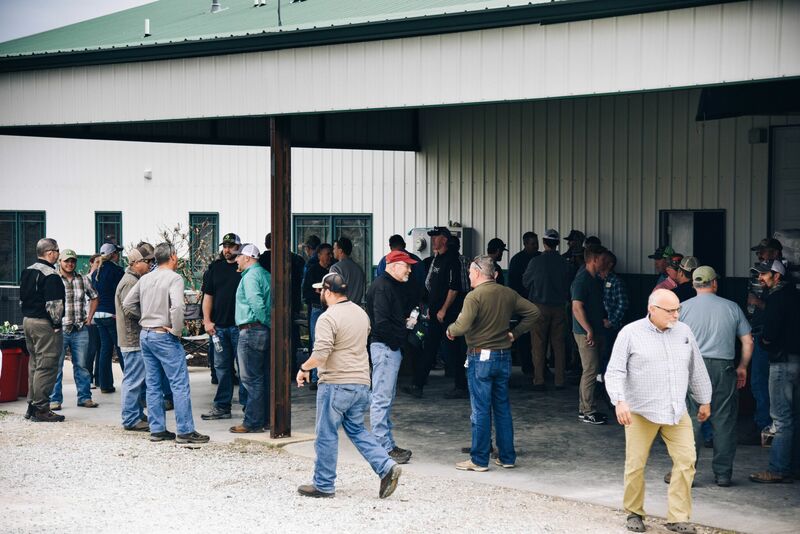 A big thanks to all that came to the field day event. We were blessed by each and every one of you! We’ve been preparing for turkey season – practicing our calls, doing a lot of prescribed fire and getting our decoys ready. While this seems obvious, it needs to be said: shoot the same shell that you’ll be using when turkey hunting. Don’t go the cheap route and use an off brand when testing your gun. Know how both your gun and the load perform together. Since you are testing the accuracy of the gun, take out the other sources of error. Use a gun rest or shooting bench, shoot from a seated position and measure the guns performance, not yours. You can go to a shooting range or do what I do and use a Lead Sled and Stable Table from Caldwell Shooting Supplies. Test the gun at different yardages. Notice how the pattern changes as the distance increases because when you are in the field that tom might hold up at 40+ yards or surprise you and come in really, really close! Making a kill with a turkey gun can be easier at 30 yards than 10 yards. This is because the shot pattern of a turkey gun is smallest at close range. It would be much easier to miss a tom at 10 yards, due to the very tight pattern, than at 30+ yards. Before you go to the range, check out this handy tool that I use: the Winchester Pattern Board Application on Winchester.com. What gauge shotgun will you be using? Consider the weight of your gear if you’re running and gunning. I have found that by carrying the light and collapsible Montana Decoys and switching to a 20 gauge, it’s a lot lighter when you’re standing on one ridge and that tom fires off on the other ridge. Winchester now has a 20 gauge in Long Beard XR. I love the idea of toting a 20 gauge over these Ozark Mountains. Think about the benefits of using a scope on your shotgun. If you’ve ever shot the Long Beard XR shells from Winchester, you know how tight they pattern. And if you’ve got a bird at 20 or 30 yards or even 15 yards, you could miss easily if you’re just using a bead. And if you’re at 40 yards, you want to make sure the gun’s bead isn’t covering the entire tom. Plus, a scope keeps your head down and you know exactly where your point of aim is going. Many of our friends across the southern portion of the US are already out in the turkey woods. We’ll be doing the same soon as we travel to hunt in Tennessee! When you’re out there – remember to take time, look around and thank the Creator for all His blessings and the ability to live in a country where we have the freedom to hunt. *When I’m hunting I wear WildEar hearing protection. These have been great to wear in the field. Small and custom fit that protect your ears from extreme noise and gun blasts that also provide hearing enhancement. I’ve lost hearing from years of shooting without protection. The WildEar helps me to hear turkeys and other sounds in the woods that I cannot hear with my natural hearing. For 15 years we’ve worked to improve the habitat and nutrition for white-tailed deer at The Proving Grounds. We named the farm The Proving Grounds because this may be one of the hardest places in North America to hunt and “grow” mature whitetails. We thought that if the tools, practices and strategies we use here for growing and hunting whitetails succeed, they can work anywhere there are white-tailed deer. We’ve had proven success with getting scrawny Ozark deer to grow antlers and increase body weights that are above average in our area. These increases are simply a bi-product of healthy deer. By improving the native browse and adding high quality forage through food plots, we have enjoyed great hunting opportunities. However, if the right quantity of nutrients isn’t in the dirt, the plants have no available nutrients to transfer to deer. Simply put, if deer don’t consume food produced from good dirt, they can’t reach their full potential. Given this very simple, but important fact, if you’re planting food plots it is of great benefit to collect soil samples each year. The price of having a soil sample analyzed is one of the least expensive and most important tools I use as a deer manager. The results of a soil sample include the soil’s pH, the amount of phosphorous, potassium and several other trace minerals (depending on the analysis requested). This information is then used to determine how much lime and fertilizer is needed to produce a quality crop based on the forage you wish to grow. To get high quality forage and therefore give the deer a better opportunity to express their full potential, it’s critical to apply the appropriate quantity and quality of each element required for each crop. Make sure you note on the form submitted for each soil test, the exact crop or blend of crops to be grown in that plot. If you don’t, the lab will either not provide any recommendations or provide a generic recommendation. Omitting the specific crop that will be planted usually results in producing crops that aren’t as palatable or nutritious for deer. I just received the soil test results from Waters Agricultural Laboratories for every food plot at The Proving Grounds. The soil management practices, cover crops and crop rotations used on those plots that have been established for several years indicate that the soil has significantly benefited from those practices. In fact, I have not had to put any fertilizer on my plots in four years because nutrients are held and recycled! 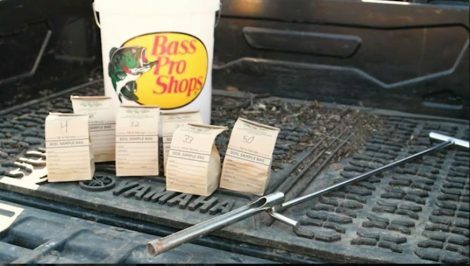 Soil tests are a fabulous tool to make sure that your deer herd has quality nutrition available. Remember, if it’s not in the dirt, it can’t get to the deer. Last week we shared turkey hunting tips for locating turkeys with an owl call. The owl call is the first call out of our vests when we hit the turkey woods. As we go through the day, other calls start to come out to call in or locate those toms. World Champion Caller James Harrison has some advice for those turkey hunts that don’t go quite as planned, when the toms went the other way or just go totally silent. In these type of hunting situations he considers one of the best tools to use to locate more gobblers a crow call. Crow calls are louder, sharper and will get the toms to gobble. 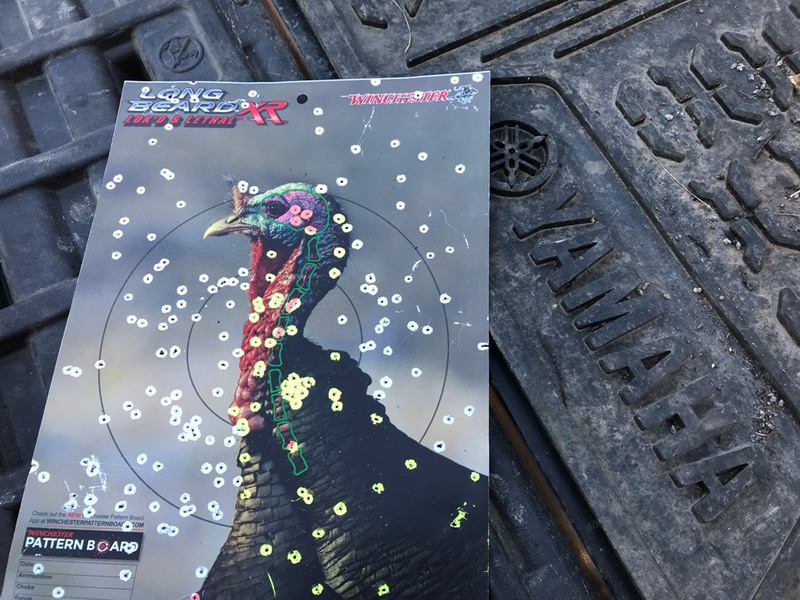 It is one of James’ favorite tools to get turkeys gobbling. In the early morning hours, if you’ve tried an owl call without response from the turkeys, James suggest changing things up. You can even use them right off the roost if you’ve got a lot of owls in your area. If the owls are hooting and the turkeys aren’t gobbling, make a crow call. He definitely recommends using a crow call from midday on. For those states that allow all day hunting, they are especially good for the afternoon and early evening before the birds go on the roost. If you’re hunting with a partner have them step away from you (the caller) so that they can listen for the tom’s response to the call (just like with the owl call) as crow calls are extremely loud. James recommends crow calls with a sequence of three to four short bursts, varied in length. Listen. Repeat. If you’re “tuned up” you can get crows to respond back and actually call in crows! When another crow responds back, he’s actually locating the turkeys for you! The more realistic you can be with your crow call the better off you’re going to be when turkey hunting! Locator calls like the owl call and the crow call can be practiced outside without educating the turkeys in your area as you “learn” the calls. So while you’re sitting on the porch, checking trail cameras, fishing at the pond, shed hunting, or just doing yard work – take your crow call along and get some practice in! A special thank you to James for these helpful tips! 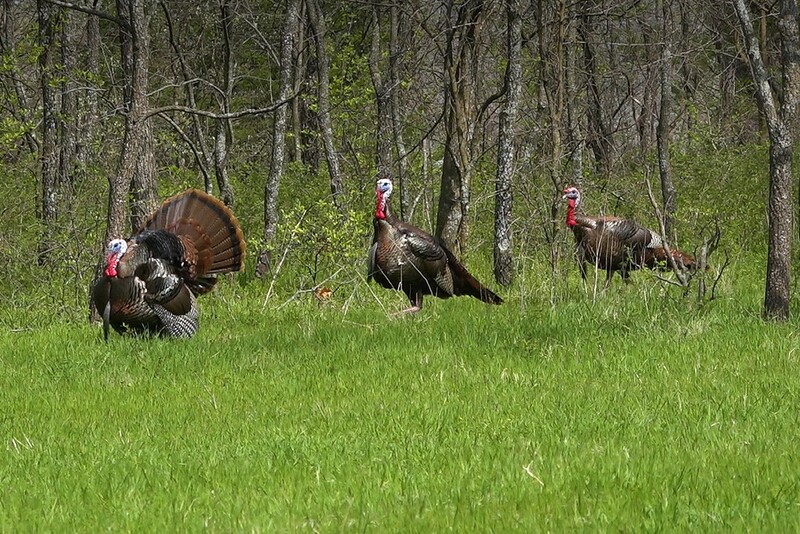 We hope they will bring you success this year on your next turkey hunt! What’s the first call to come out of your turkey vest? After talking with world champion caller James Harrison, I’ve put together a few basic tips for using an owl call. James Harrison is the mastermind and creator of the Harrison Hootin’ Stick by Hook’s Custom Calls. If you are hunting in hardwoods, it’s important to not call too loudly at first. Owls are naturally only so loud. If a turkey is nearby and you over blow, you’ll scare the tom into not gobbling. It’s best to ease into the call. A modest, softer first “hoot” is best. If all is silent, you can begin to crank up the volume. If you are hunting with a partner, send them a short distance from you (the caller). That way your partner can listen to see if there is any response to your calls. As the caller, you will have the sound of the call in your ears and may not hear a tom answer. If you are in open country, try holding the call at the end, grasping it with your thumb and index finger, making an “okay” sign with the end of the call in the middle. Then cup the other fingers to make an open “tube” on the call. This will help you get a little more range out of the call. The pitch is higher and carries a little further to get distant turkeys to gobble. The more realistic you can make your calls the better off you are. It’s safe to practice owl hooting in the pre-season. Break out the calls, step outside and work on those hoots!